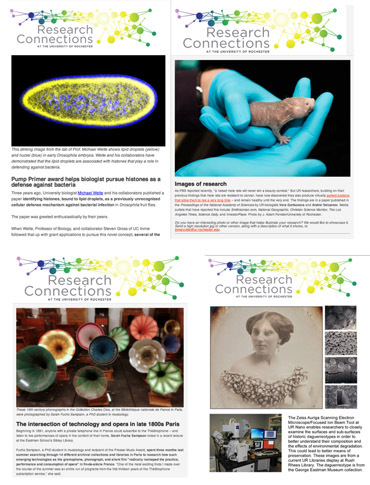 Research Connections is a weekly e-newsletter for all faculty, scientists, post docs and graduate students engaged in research at the University of Rochester. An index of people and departments mentioned in the newletter is available here. Click here for a chronological listing of Phd dissertation defenses since April 2014, by discipline, as reported to Research Connections. Send suggestions, reactions, and other observations to Bob Marcotte, bmarcotte@ur.rochester.edu.